Spatial planning became more complex in early 90s, and as a result, it required wider range of specialists that would cover more areas of research needed to meet expected quality of service. The situation has led to foundation of Research Institute of Territorial Planning by initiative of assoc. prof. doc. P. Juškevičius. First year of the Institute were quite productive – new software was introduced into workflow, which was useful to land management unit as data digitalization has begun. The process started the trend, that became the focus of the Institute’s resources by the 1995 – mass data transformation to digital form using ArchView software package. It marked of the first steps in creation of Lithuania’s first digital database. As a comparison, districts of the state managed to follow the steps just 10 years later. In order to keep data organized properly, document registries were created in National Data Bank of Spatial Planning. Transportation systems were getting more attention in late 90s. Institute, led by assoc. prof. M. Burinskienė, done citywide public transport passenger research in the capital of Lithuania that was ordered by Municipality of Vilnius. In 1998, first project that used brand-new Spatial Planning Data Bank were finished. Digital maps for metropolitan area of Vilnius, districts, municipalities of cities were prepared. Huge research project was done in 1998 – traffic flows in main streets of Vilnius were measured. In 2000, several big project for Lithuanian State Department of Tourism were delivered: camping distribution in district of Utena, car tourism development in south Lithuania and others. Projects (alongside with workforce) were divided into 3 branches. M. Burinskienė and A. Mačerinskienė led projects that were Tourism related. A. Klibavičius was responsible for traffic analysis, traffic impact assessment and taxation of infrastructure. P. Juškevičius and M. Burinskienė were responsible for creation building technical regulation projects. From 2002 to 2004, M. Burinskienė was responsible for transportation system research and feasibility study preparation. Spatial planning document preparation has reached its peak in 2004. The institute was ordered to prepare General Plan for municipality of Kelmė district. The same was done for other districts (like Alytus and Kalvarija) later that year. The preparation of documents took big part of Institute’s resources and is remembered as of the tensest periods in history of the institute, which lasted till 2009. M. Burinskienė led most of projects, but V. Grigonis solved transportation system modelling related problems. J. Zagorskas was responsible for architectural part in general plans and comprehensive plans (except for project of Dubingiai, which was done by M. Staniūnas). It should be noted that general planning and comprehensive planning makes big part of Institute’s outcome up to now. Project require strategic and analytical thinking, knowledge, skills and experience. That’s why Territorial Planning Institute employees must work together to reach peak performance. 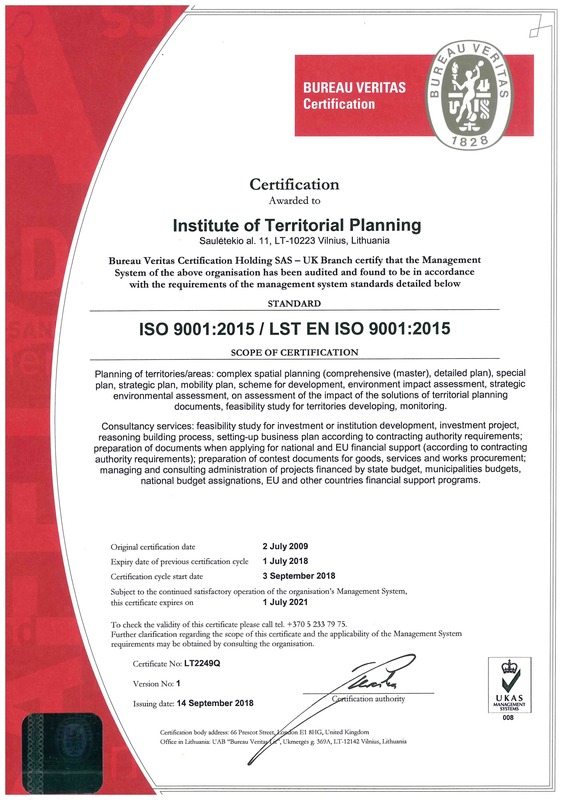 Territorial Planning Institute of Vilnius Gediminas technical university (hereinafter referred in the Institute) is widely recognised high quality and competence ensuring, transport system, spatial planning and research services provider. High tier research and experimental development project execution, and at the same time, contribution to preparation of new science workforce and high qualification specialists in order to create sustainable society. To ensure execution of strategic plan of Vilnius Gediminas Technical University and Environmental Engineering Faculty. To contribute in the state’s spatial planning policymaking and strategy, improve situation in research, teaching, law making and others areas. To prepare society-oriented spatial planning, transportation systems, research and experimental development projects, adapt innovative solutions. To participate in international projects, in order to cultivate science workers and improve their competence at international level. To create work environment that would need employee expectations. 2. Consultations in spatial planning. 3. Creation of digital maps. 4. Modeling and development of transport system. 5. Strategic environmental assessments, impact assessments, transport impact for environment assessments. 7. Scientific research works in urban planning. 8. Activities in international organizations. • Preparation of strategic environment assessment reports. Professionalism. Quality of service assurance. Institute employees and project managers are qualified in their respective fields and always expanding their knowledge. Accountability, attentiveness, awareness. We are committed to our clients, end users, environment, and community. Loyalty. Long-term cooperation ensures effective and productive work of our clients. The virtue is evoked in employees by establishing presence of responsibility and care. Flexibility. Adaptation to market’s shifting tendencies and requirements of our clients keeping in mind needs of society. Reliability. Excellent planning and management of project enables meeting stated deadlines. Innovation. Application of the latest technologies and software. Legality. All work is being done according to legal system of European Union and Republic of Lithuania. Consistent self-improvement. In order to aim for long-term cooperation with our clients, we spend resources to analyze our quality of service, make tools to avoid errors and improve system of quality management. Development of Electronic Communications Infrastructure in the Neringa Municipality Comprehensive Plan. UAB Teletowe. Project manager: Prof. M. Burinskienė. 2013–2018. Sustainable Urban Mobility Plan of Klaipėda. UAB Civitta; MB Pupa-strateginė urbanistika. Project manager: Prof. M. Burinskienė. 2016–2018. Sustainable Urban Mobility Plan of Šiauliai. UAB Atamis; UAB Smart Continent LT. Project manager: Prof. M. Burinskienė. 2016–2018. Sustainable Urban Mobility Plan of Panevėžys. UAB Civitta; MB Pupa-strateginė urbanistika. Project manager: Prof. M. Burinskienė. 2016–2018. Sustainable Urban Mobility Plan of Kaunas. UAB Civitta. Project manager: Prof. M. Burinskienė. 2017–2018. Replacement of Birštonas Resort and Birštonas Municipality General Plan. UAB Atamis. Project manager: Prof. M. Burinskienė. 2017–2018. Replacement of Šeduva City General Plan, 2016. Municipality of Radviliškis district. Project manager: J. Zagorskas. 2016–2017. Economic Assessment of Traffic Obstruction. Administration of Vilnius Municipality. Project manager: Prof. M. Burinskienė. 2017. Section of Geležinio Vilko St. from intersection with Ukmergės St. to intersection with Žalgirio St. car, bike and pedestrian traffic flow measurement at morning and afternoon rush hours. UAB Barprojektas. Project manager: Prof. M. Burinskienė. 2017. Criteria determination for size of state-owned land plot according to current operational needs and (un)reasonable stationary or non-operative time period of equipment so as to in non-auction determined way rent land plot of the state. Project manager: Prof. M. Burinskienė. 2017. Estimation of the correction factor of land plot base value in Šiauliai city when focusing on urbanism and ecology. Adjustment of city’s scheme of complex, urbanistic and ecological zoning. Municipality of Šiauliai city. Project manager: Prof. M. Burinskienė. 2015–2016. Transportation system modeling of convertible industrial area defined by Subačiaus St., Drujos St. and Paplaujos St. UAB Unitecus. Project manager: Assoc. Prof. V. Grigonis. 2016. Monitoring Report of the Implementation of the Alytus District General Plan‘s Solutions. UAB TAEM Urbanistai. Project manager: Prof. M. Burinskienė. 2016. Širvintai district Comprehensive Plan of local roads and street infrastructure development. Municipality administration of Širvintai district. Project manager: Prof. M. Burinskienė. 2015. Kačerginė Town Area Boundary Map Preparation. Kačerginė municipality. Project manager: Prof. M. Burinskienė. 2015. Zapyškis Town Area Boundary Map Preparation. Zapyškis municipality. Project manager: Prof. M. Burinskienė. 2015. Kulautuva Town Area Boundary Map Preparation. Kulautuva municipality. Project manager: Prof. M. Burinskienė. 2015. General plan of Vyžuoniai town area. Municipality of Utena district. Project manager: J. Zagorskas. 2015. Preparation of a Normative Construction Technical Document for the Design of Residential Buildings (for various social groups). Project manager: Prof. M. Burinskienė. 2014. Planning Norm Project for Transport Systems of Urban Areas. Project manager: Prof. M. Burinskienė. 2014. Detailed plans of the development of graveyard areas located in the Molėtai district. Molėtai District Municipality. Project manager: M. Burinskienė. 2014. Žvyrkalnis block of Molėtai city Detailed Plan correction. Molėtai District Municipality. Project manager: Prof. M. Burinskienė. 2013–2014. Planning Norms for Transport Systems of Urban Areas. Ministry of Environment. Project manager: Prof. M. Burinskienė. 2014. Transportation service analysis of planned trading point on Naugarduko St. 84 in Vilnius. UAB Largas. Project manager: Project manager: V. Grigonis. 2013. General Plan of Geležiai town area. Municipality of Panevėžys district. Project manager: Prof. M. Burinskienė. 2013–2014. Anykščiai District Development of Bicycle Paths Comprehensive Plan. Municipality of Anykščiai district. Project manager: Prof. M. Burinskienė. 2013–2015. Trakai District Recreation, Tourism and Tourism Complexes Development Comprehensive Plan. UAB Vandens projektai. Project manager: Prof. M. Burinskienė. 2013–2014. Study of transportation system design for cities, towns and villages; street design study and study of construction regulation improvement. Ministry of Environment. Project manager: Prof. M. Burinskienė. 2013. General Plan of Giedraičiai town area. Municipality of Molėtai district. Project manager: Prof. M. Burinskienė. 2013. General Plan of Kaunas City area: public transport and cycling infrastructure sections. UAB Urbanistika. Project manager: Prof. M. Burinskienė. 2012–2013. Preparation of procedural documentation for monitoring, supervision and control of Republic of Lithuania territory and solution implementation for said territory. Ministry of Environment. Project manager: Prof. M. Burinskienė. 2013. General Plan of Šilai Town. Municipality of Panevėžys district. Project manager: Prof. M. Burinskienė. 2012–2013. Feasibility study of Galadausis landscape reserve establishment. Municipality administration of Lazdijai district. Project manager: Prof. M. Burinskienė. 2012. Preparation of study “Research of Multi-modal Trip Promotion using Park&Ride, Bike&Ride and other concepts”. Ministry of Transport and Communication. Project manager: Prof. M. Burinskienė. 2012. Organization of Lithuanian Urban Forum. Ministry of Environment. Project manager: Prof. M. Burinskienė. 2012. Transportation system modeling of Utena City and district. Route network correction. Municipality administration of Utena district. Project manager: Prof. M. Burinskienė. 2012. Deveitoniai village solar energy Comprehensive Plan and Detailer Plan. UAB Open Management. 2011–2012. Vilnius City New Transport Systems Comprehensive Plan. Project manager: Prof. M. Burinskienė. 2012. Giedraičiai town area General Plan. Municipality Administration of Molėtai district. Project manager: Prof. M. Burinskienė. 2011–2012. Detailed plans of the development of graveyard areas located in the Molėtai district. Molėtai District Municipality. Project manager: M. Burinskienė. 2011–2013. Žvyrkalnis block of Molėtai city Detailed Plan correction. Molėtai District Municipality. Project manager: Prof. M. Burinskienė. 2011–2013. Emendation of General Plan of Alytus district municipality. Municipality Administration of Alytus district. Project manager: Prof. M. Burinskienė. 2011–2012. General Plan of Kaunas City area: public transport and cycling infrastructure sections. UAB Urbanistika. Project manager: Prof. M. Burinskienė. 2011–2012. Development planning rules of cycling infrastructure. Lithuanian Road Administration under the Ministry of Transport and Communications. Project manager: Prof. M. Burinskienė. 2011–2012. Kėdainiai Town Local Road Network Comprehensive Plan. Municipality Administration of Kedainiai district. Project manager: Prof. M. Burinskienė. 2011–2012. Telšiai, Mastis Lake Water Tourism Routes Comprehensive Plan. Municipality Administration of Telšiai district. Project manager: Prof. M. Burinskienė. 2011–2012. Study of possible reduction of negative impact created by transport, which serves MAXIMA retail store on Totorių St 8. by making database of street, traffic flow and building on Totorių St 8. UAB MAXIMA LT. Project manager: A. Kalibavičius. 2010. Urban and infrastructure development plan for segment of Tauragė City: transportation and architecture sections. UAB Statybos strategija. Project manager: Prof. M. Burinskienė. 2010–2011. Širvintai District Water Supply and Sanitation Infrastructure Development Comprehensive Plan. Municipality Administration of Širvintai District. Project manager: Prof. M. Burinskienė. 2010–2011. Kelmė District Railway Stations in Residential Areas Title Change and the Boundaries Change Comprehensive Plan. Municipality Administration of Kelmė District. Project manager: Prof. M. Burinskienė. 2010–2011. Technical Requirements for Street Projects. Ministry of Environment. Project manager: Prof. M. Burinskienė. 2010. General Plan of Širvintai City area: socioeconomic and culture sections. UAB Urbanistika. Project manager: Prof. M. Burinskienė. 2010–2012. Feasibility study of building construction justification. Municipality Administration of Širvintai district. Project manager: Prof. M. Burinskienė. 2009. General Plan of Alytus district and General Plan of Lazdijai district: printing service. LitPol Link. Project manager: Prof. M. Burinskienė. 2009. Research of traffic organization of Pramonė prospekt, Chemijos St., Draugystės St. in Kaunas City. UAB Ramboll Lietuva. Project manager: V. Grigonis. 2009. General Plan of Dubingiai Town. Municipality Administration of Molėtai district. Project manager: Prof. M. Burinskienė. 2009–2010. Pasvalys District Water Supply and Sanitation Infrastructure Development Comprehensive Plan. Municipality Administration of Pasvalys district. Project manager: Prof. M. Burinskienė. 2009–2010. General plan of intensive development area of Panevėžys bypass between Panevėžys City and Via Baltica (A9/272). Municipality Administration of Panevėžys district. Project manager: Prof. M. Burinskienė. 2009–2010. General Plan of Daugai town. UAB Urbanistika. Project manager: Prof. M. Burinskienė. 2009–2010. Transport service research of the retail store on Dariaus ir Girėno St 6, in Kelmė City. UAB MAXIMA LT. Project manager: V. Grigonis. 2009–2010. Investment project „Reconstruction of A. Baranausko St. in Utena City“. Municipality Administration of Utena district. Project manager: R. Užpalytė-Vitkūnienė. 2008. Research of regular passenger transport system for local transportation of Marijampolė city and suburb. Municipality Administration of Marijampolė district. Project manager: Prof. M. Burinskienė. 2008. General Plan of Molėtai town. Municipality Administration of Molėtai district. Project manager: Prof. M. Burinskienė. 2008–2009. Solution (stated in General plan of Alytus district) implementation plan for zones under influence of Alytus City. Municipality Administration of Alytus district. Project manager: Prof. M. Burinskienė. 2008–2009. Street category determination of Naujoji Akmenė, Akmenė and Venta located in Akmenė district. Municipality Administration of Akmenė district. Project manager: Prof. M. Burinskienė. 2008. Alytus District General Plan, solutions till 2015 (digital maps). LitPol Link. Project manager: Prof. M. Burinskienė. 2008. Derivative summary of the valuable properties of the city of Rusnė part, called Skirvytėlė and analysis of the database of cultural heritage objects and the systematization of historical-archival material. UAB Statybos strategija. Project manager: Prof. M. Burinskienė. 2008. Derivative summary of the valuable properties of the territory of the Old Town of Telšiai and analysis of the database of cultural heritage objects and the systematization of historical-archival material. UAB Statybos strategija. Project manager: Prof. M. Burinskienė. 2008. General Plan of Telšiai Town. Municipality Administration of Telšiai district. Project manager: Prof. M. Burinskienė. 2007–2010. Supermarket Location in Akmenė district Comprehensive Plan. Municipality Administration of Akmenė district. Project manager: J. Zagorskas. 2007. General Plan of Lazdijai district. Municipality Administration of Lazdijai district. Project manager: Prof. M. Burinskienė. 2007–2008. General Plan of Radviliškis district. Municipality Administration of Radviliškis district. Project manager: Prof. M. Burinskienė. 2007–2009. Spatial distribution of major trading companies in Ukmergė City comprehensive plan. UAB Inrestus and Municipality Administration of Ukmergė district. Project manager: Prof. M. Burinskienė. 2007–2008. Preparation of a project description procedure of state-owned land plots, validating the existing regime of use and management of the territory. Būsto ir urbanistinės plėtros agentūra. Project manager: Prof. M. Burinskienė. 2007. Justification of project “Reconstruction of Pievų St. section from junction with Northern bypass”. Municipality Administration of Klaipėda City. Project manager: Prof. M. Burinskienė. 2006. General Plans of Akmenė district, Naujoji Akmenė Town, Akmenė Town, Venta Town. Municipality Administration of Akmenė district. Project manager: Prof. M. Burinskienė. 2006–2008. Feasibility study of Geležinio Vilko St. and Gerosios vilties St. transport hub development opportunities. Project manager: Prof. M. Burinskienė. 2006. Research of strategy development for Marijampolė City transportation system and traffic safety. UAB VP Market. Project manager: A. Klibavičius. 2006. General Plan of Tauragė City and General Plan of Tauragė district. Municipality Administration of Tauragė district. Project manager: Prof. M. Burinskienė. 2006–2007. General Plan of Pasvalys district. Municipality Administration of Pasvalys district. Project manager: Prof. M. Burinskienė. 2006–2007. General Plan of Joniškis district. Municipality Administration of Joniškis district. Project manager: Prof. M. Burinskienė. 2006–2007. General Plan of Radviliškis City. Municipality Administration of Radviliškis district. Project manager: Prof. M. Burinskienė. 2006–2007. General Plan of Telšiai district. Municipality Administration of Telšiai district. Project manager: Prof. M. Burinskienė. 2006–2007. General Plan of Plungė City and General Plan of Plungė district. Municipality Administration of Plungė district. Project manager: Prof. M. Burinskienė. 2006–2007. General Plan of Republic of Lithuania correction. Ministry of Environment. Project manager: Prof. M. Burinskienė. 2006. 2007 – 2013 Baltic Sea region programme “Climate Change, Cultural Heritage and Anergy Efficient Monuments”. Lifetime: 2010 – 2013. Project manager responsible for VGTU’s part of initiative: Prof. Dr. M. Burinskienė. Project team: Territorial Planning Institute. The ESPON 2013 Programme, “the European Observation Network for Territorial Development and Cohesion”. Project: “Establishment of a Transnational Espon Training Programme to Stimulate Interest to Espon 2013 Knowledge”. Lifetime: 2010 – 2013 m. Project manager responsible for VGTU’s part of initiative: Prof. Dr. M. Burinskienė. Project team: Territorial Planning Institute. The ESPON 2013 Programme. Project: “ESPON Evidence in a North European Context, ENECON”. Lifetime: 2012 – 2014. Project manager responsible for VGTU’s part of initiative: Prof. Dr. M. Burinskienė. Project team: Territorial Planning Institute. Sweden Institute’s Visby programme. Project: “Capacity building in Sustainable urban planning and development in Lithuania, Russia, Sweden and Ukraine”. Lifetime: 2010 – 2013. Coordinator: KTH Royal Institute of Technology in Stockholm. Project manager responsible for VGTU’s part of initiative: Prof. Dr. M. Burinskienė. TEMPUS programme. “Development and Improvement of Automotive and Urban Engineering Studies in Serbia (DIAUSS)”. Lifetime: 2011 – 2014. Project manager responsible for VGTU’s part of initiative: Prof. Dr. M. Burinskienė.